The Modelling News: Luftwaffe Gallery 4 – Erik Mombeeck’s latest Luftwaffe picture book reviewed..
Luftwaffe Gallery 4 – Erik Mombeeck’s latest Luftwaffe picture book reviewed..
Erik Mombeeck’s latest pictorial book is fifty six pages of beautiful period photographs and lavish illustrations representing the art and artifacts of the Luftwaffe of the Second World War. These books are full of personal accounts from the people that were there in the action and the history is researched thoroughly by one of the best in his field. We liked some of his books we have reviewed already here at TMN, but would this one be any better? Or for that matter a misfire? Let’s look at volume #4 a little closer. After a short introduction by the author we look at the “Emblem gallery: Luftwaffe aircraft eagle emblems”. This section of the book shows us the varying different aircraft and their emblems that are associated with an eagle. As you can imagine the Germans used their national symbol quite a bit, but featured here are pilots from the Reich with heritage from other countries like Poland and Austria who had the Eagle as a symbol as well. I learnt quite a bit here, the fact that the red and white emblem of JG1 was a number 1 with eagle wings - I had just never noticed it before. There are some really nice pictures of these Luftwaffe planes at close quarters and Thierry’s profiles – matched with RLM colour numbers – help you understand the emblems with the added text by the author. This pattern is pretty much followed right throughout the book. Fighters like the Bf 109, Bf 110 & Fw-190, as well as bombers like the Ju-88 and Ju-87 are features as well as a Bf 108 Taifun trainer! I liked very much the Bf 110 with the winged eagle attacking the British lion with little wings. There are a fair few here bashing the Brits which was good sport at the time I suppose. 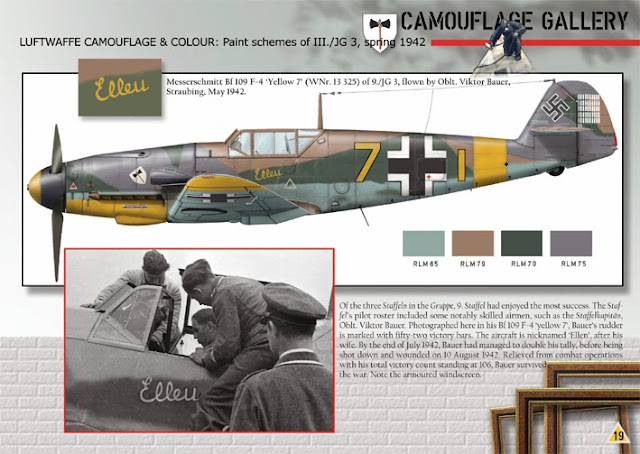 The second chapter has some really interesting colours of Bf 109’s – the “Camouflage gallery: paint schemes of iii./jg 3, spring 1942” follows several “F” models which were due for the Mediterranean that were hastily re-directed to the eastern front and re painted to match their new theatre of operations. These ‘109s looked quite different in their RLM65 undersides W/ RLM79/70/75 upperside camo and most had a yellow name for their aircraft as well. This is conveyed equally well by the mixture of large pictures, great text and well-drawn aircraft in the profiles. In the “Equipment gallery” section of this book we feature something kind of well-known and ignored in equal parts - metal pennants that are used either on airfields, buildings and vehicles and on the aerials of the aircraft’s themselves. Several of the small pennants attached to the aerials I haven’t really seen featured on model kits and on decal sheets – so this section was a bit of a revelation to me. They are depicted here both in profiles and evidentially in the photographs that support them. There are some well-known aircraft that I never knew flew pennants! Following neatly into the next section we have two pages of coloured galleries featuring the Ju-87 (one of them has a pennant) Just two pages but lovely piccies..
Next we see part two of the series of the “Equipment gallery: pilot victory sticks” in which the “alter hase” or old hares and established pilots carried long, hand carved and lavishly detailed decorative walking sticks the pilots carried with them as a sign of status and achievement. Often these were detailed with each individual kill and with e more successful pilots many many kills which couldn’t be shown were decorated in other lavish ways. It was nice to read the mission highlights of the favourite wingman to Helmut Wick, who’s stick is featured amongst many other aces. Lastly we have a section authored by the respected Luftwaffe historian Kees Mol, who takes us through a “Markings gallery: the tail band colours of iii./jg 6” in which the author takes us through a lot of pictorial evidence in the act of trying to determine the colour scheme and so the tail bands of the unit this aircraft wore. Lots of good pictures and research here. As always the author includes the much welcomed contributions to the earlier books – sometimes additions and sometimes corrections, in their Reader's corner at the end of the book. Well I have read the three earlier books in this series – and I have to say I like this one the best so far! For the fact that yes it is new and fresh to me – with many pictures I haven’t seen before, but also because I learned a hell of a lot reading it and it was an interesting read. I think the author and his artist have found an excellent combination with this book – now we are all looking forward to number five! Lu/Ga4 is now available from Erik’s site – along with all of his other great books - right now – Thanks to him for sending it to us to read and review.